Sat. 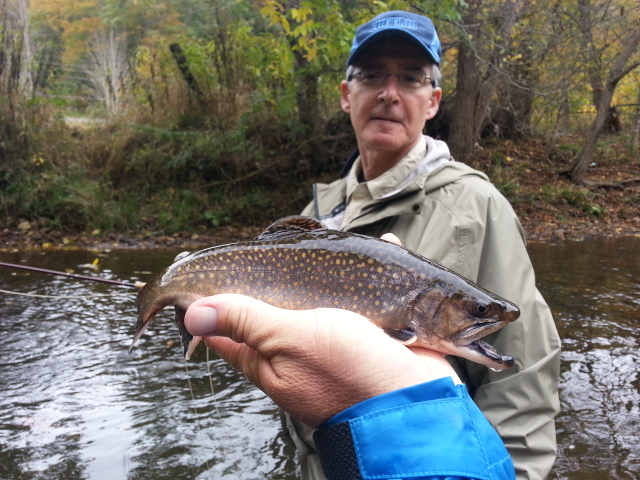 Oct.26, 2013…..Good day so far guiding Dr Spencer Tilley near Asheville, NC we have caught two dozen fish and a good many on dries. 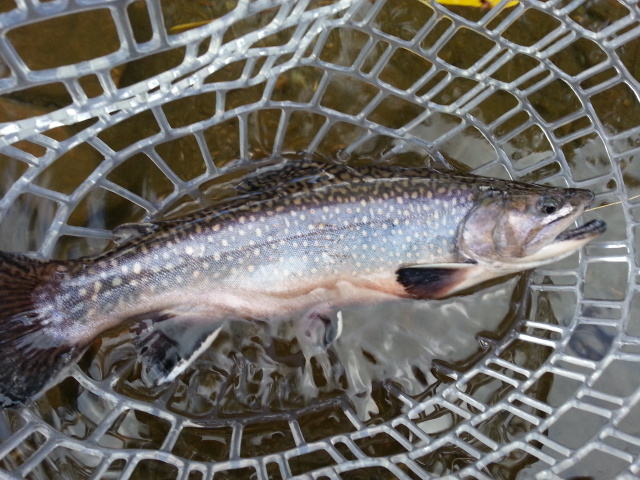 Wild rainbows and a smattering of brookies…. Cold last night it was low to mid 20sF…. Sat . Oct 26, 2013….. Had a great day yesterday despite chilly temps and some October snow. Things were pretty white in the high country and it snowed on us for the first hour of the day. I guided Dr Spencer Tilley and we fished two waters and landed about 30 fish. 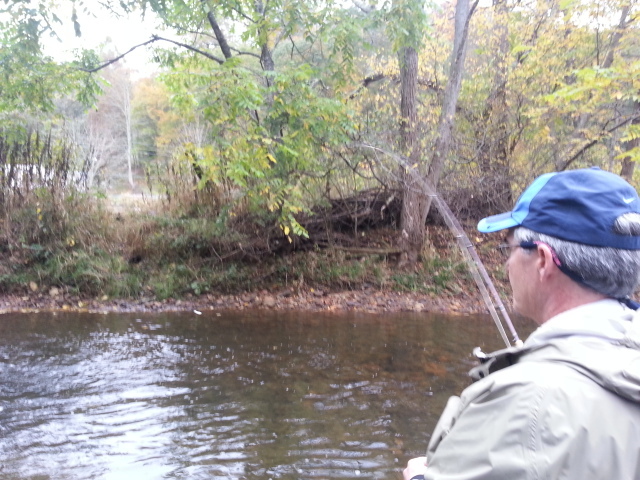 We even got in on some dry fly fishing late in the day. Cold, windy, brisk is what it was and what it will be today. We are getting ready to have breakfast and then head out for a day of fishing. Temps are in the low 20s this morning . Fri. Oct 25, 2013…..Headed out bright n early and it promises to be a great day even with a 50 to 70% chance of snow showers or wintry mix. I am guiding Dr Spencer Tilley two days back to back and looking forward to a great outing. This morning’s photo is one of a foul weather brown….a large one, and that one was landed by one of my clients from Chapel Hill, NC Dr Hy Muss. 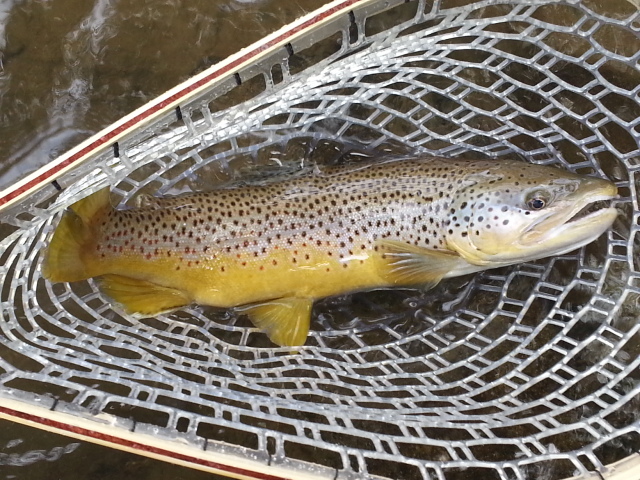 It was a huge brown…..hope we can put one or more of those in the net tomorrow. 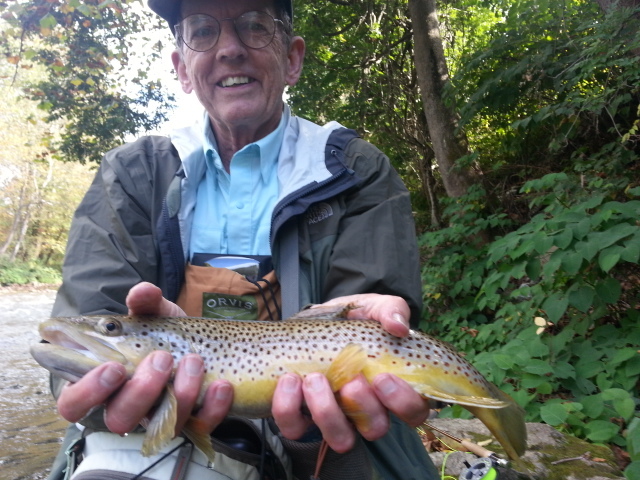 More to come…..enjoy your Friday…..
Two Day Report from our NC and TN Fishing…..
Fri. Oct. 18, 2013…….Our Annual South Holston Fall TN Tailwaters Trip One…..5 Anglers, Jim Ritter, Phil Synder, Pennsylvania, Durham Potter, Raleigh, NC, Bernd Druebbisch, Greensboro, NC, Dr Bose Ravenel, High Point, NC….On the first day we had some fishing on the SoHo but its been limited due to releases. We fished the lower stretch just above Boone Lake so as to be downstream from the early release but the water was up by 11am. We landed about 12 fish , I think, not terrible but not as it would normally be if we had had a full day there. We had had an early breakfast and we headed back after fishing to have lunch and then head to another river on the NC side. We went to plan B and rode over Roan Mtn to the NC side of the hills and caught between 25 and 30 fish….decent, or at least better than the morning.. We did catch a few nice fish fish including a couple citation sized fish…including a huge brookie by Jim Ritter and a nice brown by Dr Bose Ravenel….and lost a couple large fish too. We had a nice Carolina BBQ dinner and then headed back to our place for a hot shower, and some relax time and tying flies…..one of the great things about the trip is the fellowship…and everyone seems to really enjoy that aspect of it. Day Two, we got up and went upstream after an early pre dawn breakfast and fished another area…we landed 3 fish before the water reached us…pretty slow by SoHo standards, and while morning can be slow on tailwaters in Fall its normally better than that. We had high water by 10am and headed back in to pack up our stuff. 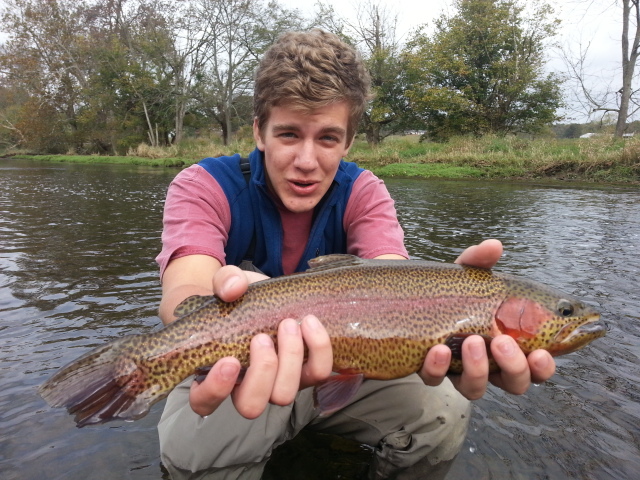 We were on the road by 11am and stopped by another NC water….I am guessing between 4 guys we landed maybe 40 fish. Much better than yesterday and was the best fishing of the trip. Not the SoHo fishing we’d normally find in Oct, but several of the guys had come from a good distance away and we had to make the best of it. 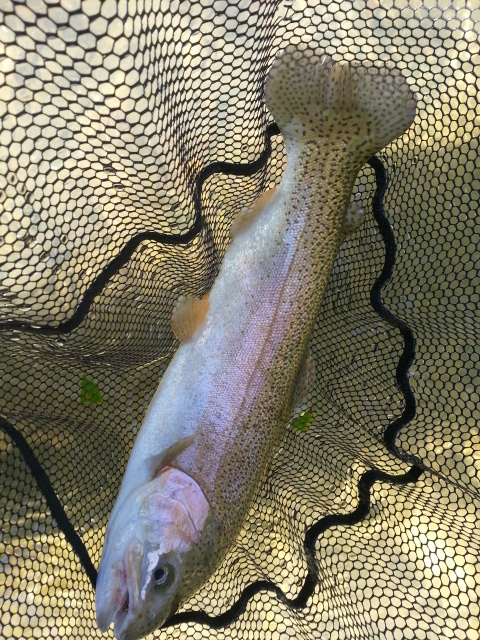 We did have some pretty good dry fly fishing in the afternoon and a light bwo hatch which the fish responded to in earnest. All in all it was a great trip still and really enjoying this great group of guys…always a bummer to see it come to an end. Really enjoyed these guys. Cold front passed through late yesterday afternoon and while I hate the wind and the leaf fall it brings the best part is the leaves fall and are gone on trees lining the water first….. so we are the first to see relief! Wet n Cool on the SoHo…. Thurs. 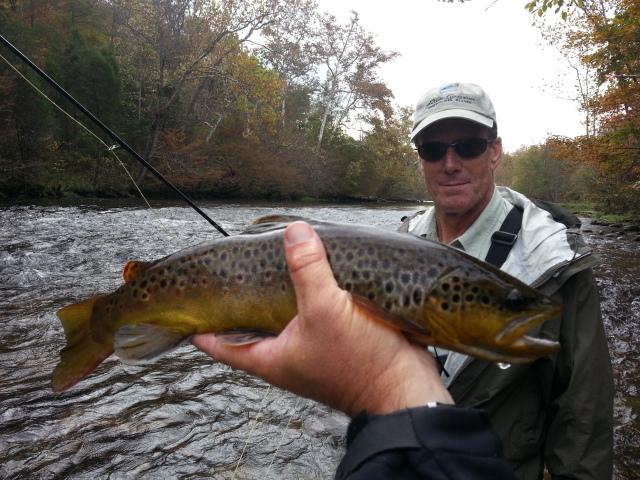 Oct. 17, 2013……Today is our final day of a 3 day group trip with Phil Snyder and Jim Ritter of PA, Dr Bose Ravenel, Durham Potter, and Bernd Druebbisch of NC, we have had some fishing on the SoHo but its been limited due to releases. 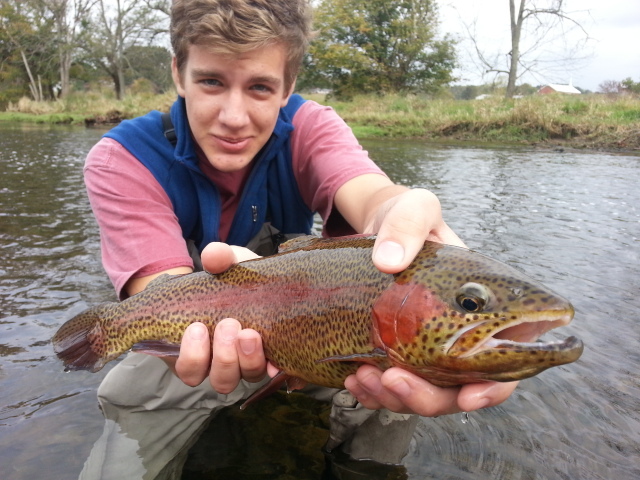 We fished two waters yesterday and caught between 25 and 30 fish….decent but not great. We did catch a few nice fish fish including a couple citation sized fish…..and lost a couple large fish too. 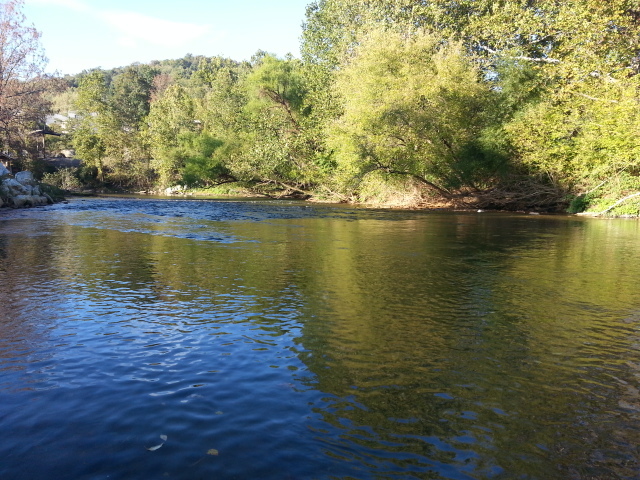 We are up and out early and will be fishing the SoHo early amd then hitting a small NC water on the way back today. We have a front coming in and some rain to deal with so hoping for a good day. 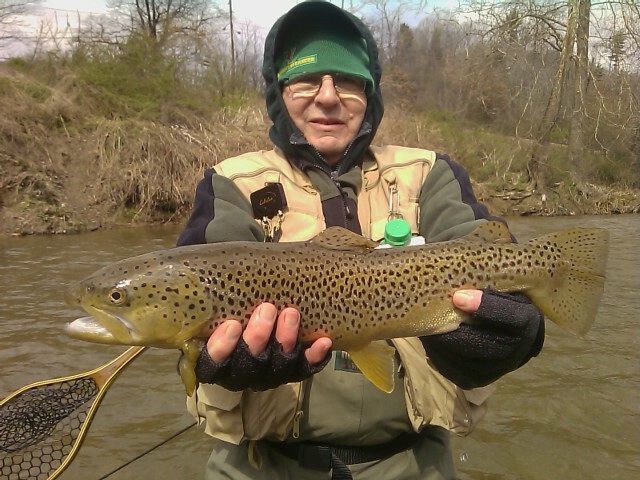 Have a guided 2 angler trip with David Howard tomorrow and looking forward to that as well. More to come……have a great morning…. Another Cloudy, Wet Day in the Mtns…..
Tues. Oct 14, 2013…….Great to have a low sky, fog, and rain this time of year….the fish really eat when it is like that. Guided Dr. Mike Delissio, Cary, NC, NC Mtns, a cool, cloudy, rainy day for the most part til the sun came out late afternoon. We had cloudy, cool weather and it was great….I love days like this in the Fall. Fish eat when its like this. I met Mike early and we were on the water by a little after 8am. It was game on from the start, we did quite well, all with nymphs til the end of the day. 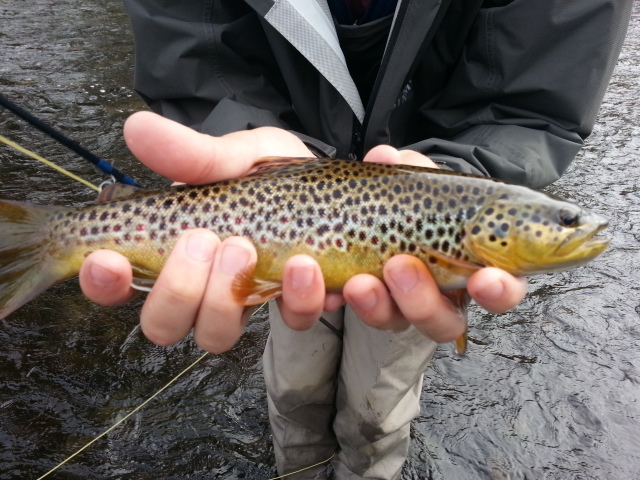 Mike landed about 35 to 40 fish, a mix of rainbows, browns, and brookies…..and we had great fishing til the sun came out. That seemed to kind of slow things down a bit. We fished a few different spots. Really surprising how the water has come back down after a wet year and the heavy rains of early last week. Some places are low and really clear. Really clear. Not everywhere, but I’d say most. And some look like summer low and clear. 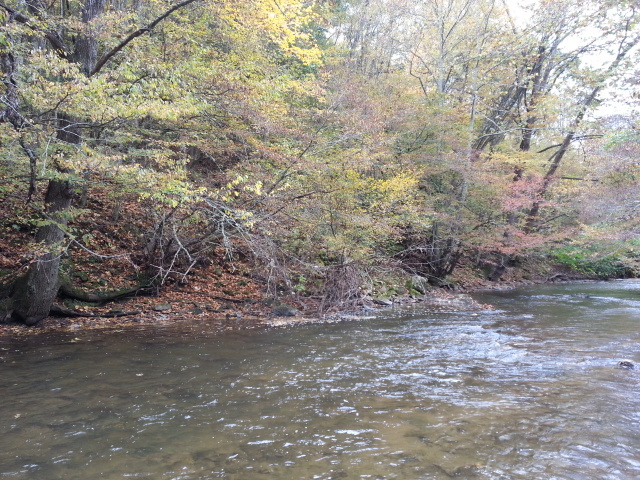 I am expecting the fishing subsurface to go from good to great to phenomenal when we get some really chilly weather. Water temps range from low to mid 50s in some spots to around 60 to 62F in others. That is dependent on elevation. Below 60F is the magic number for most hatches (especially BWOs) and one last hurrah of dry fly fishing before winter comes. Great day today, enjoyed spending it with Mike, we had a great time and caught a pile of fish. And finished up catching fish with dry flies on the New…..The only damper is when stupid me left a large and $$$ graphite composite landing net on top of the car and a New 9 foot 4 weight SAGE ZXL with a gold bar stock Loomis Reel, about a $800 outfit with a Wulff triangle taper line on top of the car and drove off…..What was I thinking? Going searching for tomorrow morning before our big SoHo trip…..What a dumb move that was! Headed over today to East TN to do one of our Fall Group Trips, and I’ll be joined by Phil Snyder and Jim Ritter of Pennsylvania, Durham Potter, Raleigh, NC, Dr. Bose Ravenel, High Point, NC, and Bernd Druebbisch of Greensboro, NC. Looks like cloudy and cool, maybe a bit of sun. Looks like we’ll fish a lot of ground over the next 2 and a half days. Cloudy, Cool, And Wet on the SoHo….. Sat. Oct 12, 2013……In off several days hard fishin’……oh I know it sounds like complaining. Enough of that. Here’s a report on yesterday’s fishing on the South Holston guiding Ron and Robert Davis from Winston-Salem, NC, and their friend David Yeager who is here on a visit from Montana. We fished the Soho and landed about 20 to 25 fish. They were on at 1pm with the release, so we ha d til at least 3:00 or 3:15 where we fished until we would have to move. It was surprisingly slow, water temps were up a little from warm past two weeks. No bugs coming off. 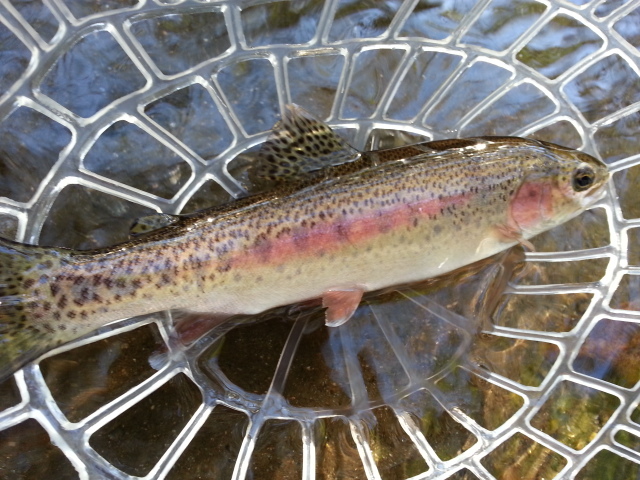 But we got a pair of 2 20 inch plus rainbows, landed one and lost one just a few feet from the net. 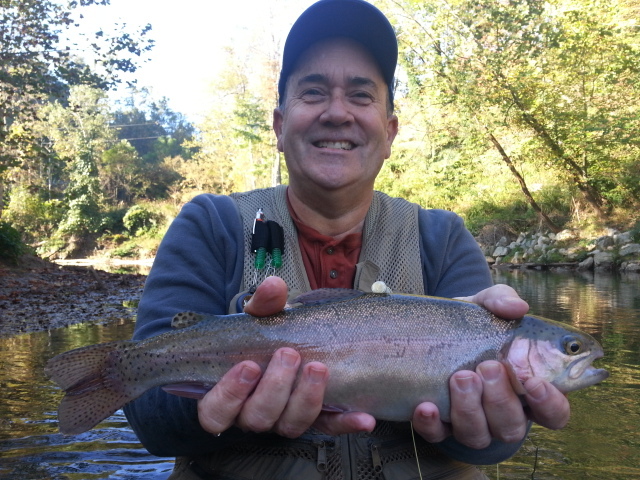 It was very crowded,.., particularly on the downstream areas of the South Holston ….a rarity in some respects….guess its the nice weather…..and limited wading schedule over the past week. Water temp was 61F……my thermometer and past experience of 27yrs here tell me we are only a few chilly nights away from great Bwo and sulphurs for Fall….in most years the sulphurs make a brief showing in the Fall and last til Christmas in some cases, at least November most of the time. In the center of photo is a Fall #20 Baetis nymph preparing to hatch very soon……Our Fall bwos are a fine gravel swimming mayfly species….find shallow, gravel covered runs with pebbles to rocks the size of a softball and you are in Baetis promised land. Baetis is what one of our main Blue Winged Olives are called when using the scientific or Latin name. They are a size 20 this time of year on some parts of the river and have 3 broods per year. The big areas on a lot of rivers are those long, gentle riffles and particularly islands. Find island areas in the river and you have found Baetis water for sure. That is a spring hatch, a summer hatch, and a Fall hatch. 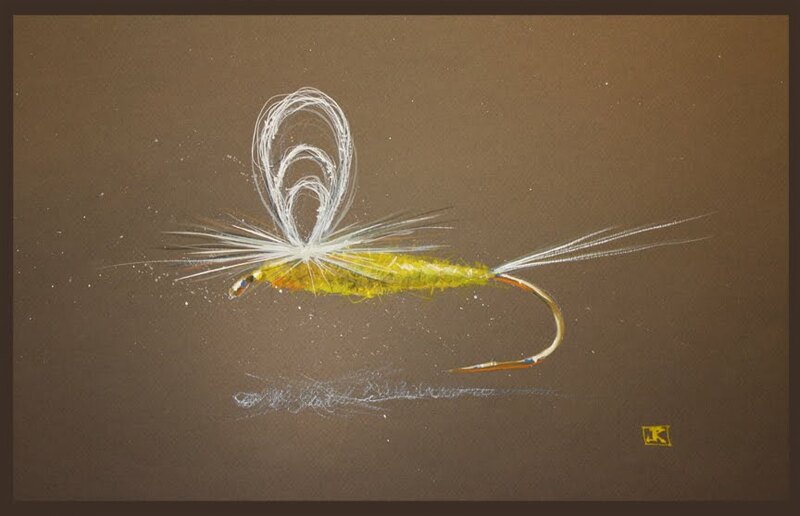 If you are a fly angler who loves the dry fly that should make you Happy, Happy, Happy….. 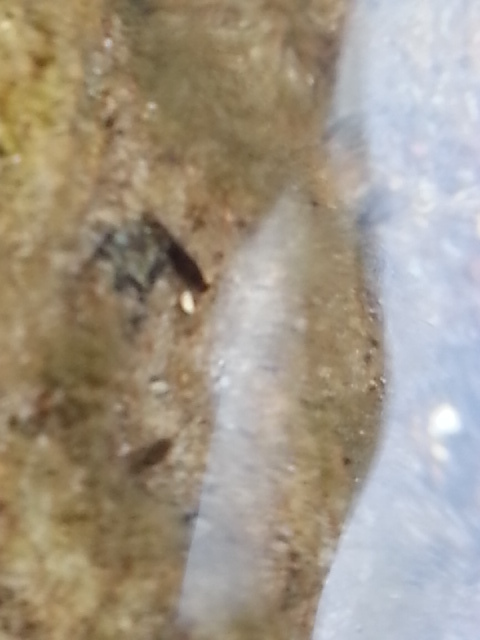 Note in the very center of picture a Baetis nymph…..its the only long, slender (skinny) nymph. 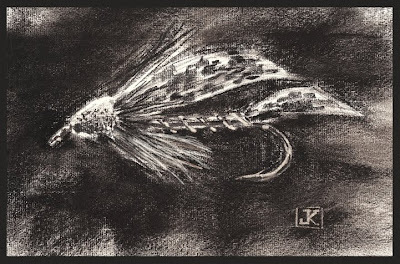 Any Nymph imitation should have that trait….and its one of the primary reasons anglers fishing zebra midges do so well a good bit of the time. They are imitating Baetis and doing so without knowing it. 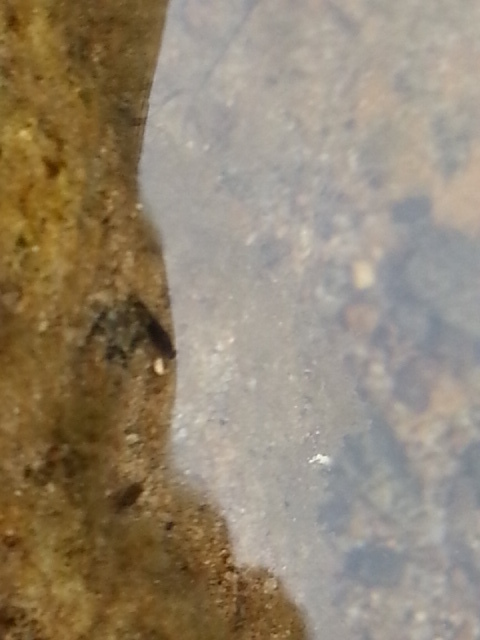 If you find nymphs you will find them on the protected downstream /downcurrent side of rocks. Have a busy week coming up……5 days in a row of trips, first one on Monday guiding Mike Delissio of Raleigh, NC, and then a three day trip with Dr. Bose Ravenel, High Point, NC, Jim Ritter and Phil Snyder of Pennsylvania, Bernd Druebbisch of Greensboro, NC, Durham Potter, Raleigh, NC….and ending up the week guiding a day with David Howard, High Point, NC. Should have lots of great reports and pics. One thing is for sure….leaves are changing and flying….nearing peak in a lot of places. Still mixed and a little green below 3000ft but it won’t be that way for long. I think in the coming week we are going to see a quick change to much cooler weather and the beginning of both the brook and brown trout spawns…..
Have a blessed Sunday……..Tight Lines..! Cloudy Saturday on the Soho…. Sat. 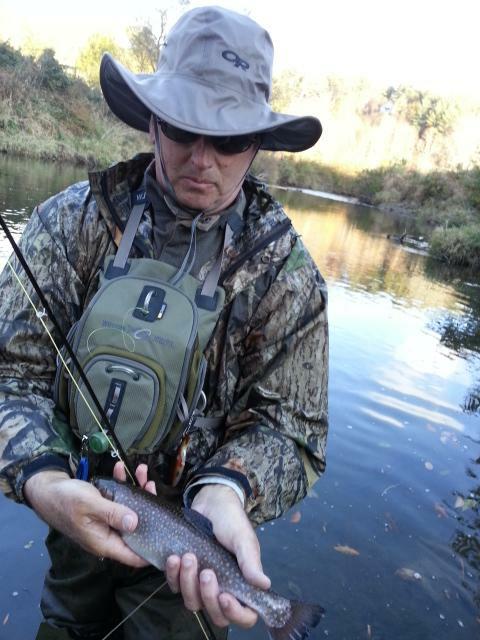 Oct 12, 2013…..Had a good day guiding Ron and Robert Davis, Winston-Salem, NC, and David Yeager from Montana…we fished the Soho and landed about 20 to 25 fish. It was surprisingly slow, water temps were up a little from warm past two weeks. No bugs coming off. 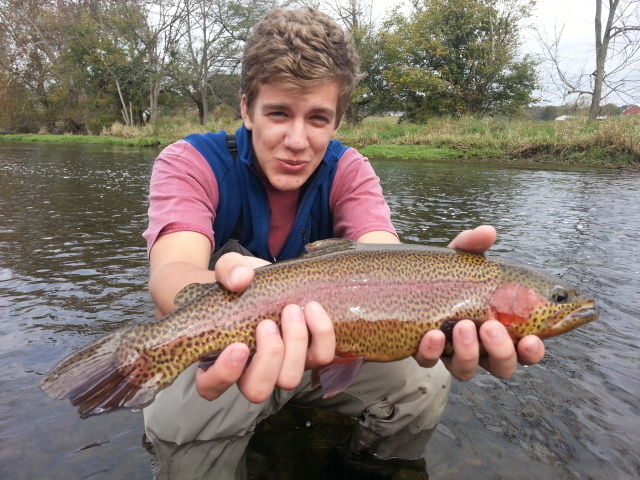 But we got a pair of 2 20 inch plus rainbows, landed one and lost one feet from the net. Getting ready to head to one last spot before calling it a day. Fri. Oct. 11, 2013 ….A cold front pushed through this morning, cool and breezy and lots of leaves flying. Guided Tony Pugh, Asheboro, NC, one of my favorite clients and regular clients and we had planned to fish the South Holston but they were dumping water. So we opted to fish some NC water nearby in lieu of that. 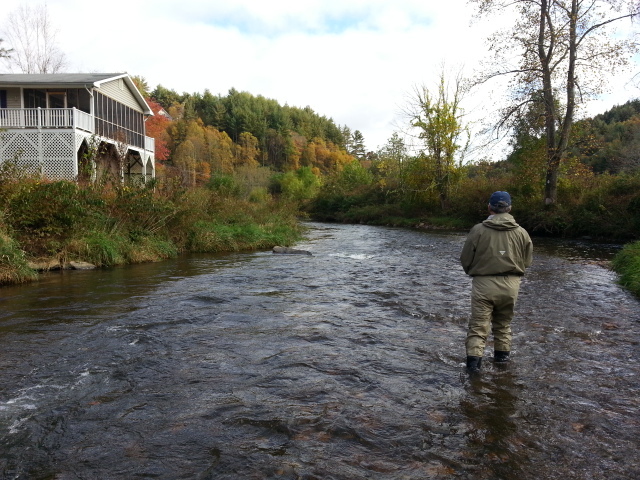 The water was in great shape, much better than expected given the heavy rains of earlier in the week. Tony and I met up bright and early and were in the water before anyone on the river…..it was chilly, like low 40sF and you could see your breath…..the chill of Fall for sure. 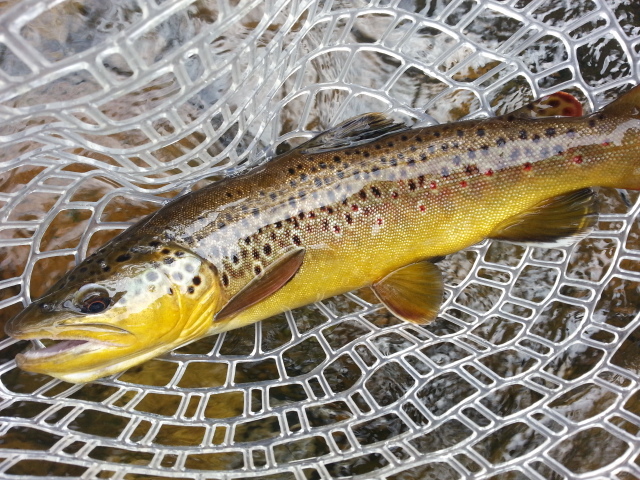 Things were slow to start, which suprised me, as where we were fishing is a great place from now through late spring. We caught a few to start , maybe 2 or 3 fish, landed one 18″ rainbow and had another large one come off….we moved around a bunch. 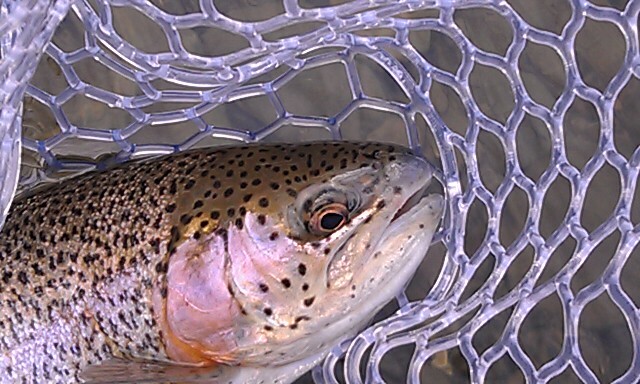 We hit another stretch of water and it was better, and yielded probably a dozen to fifteen fish…and we landed the fish of the day a 24″ rainbow. We hit several more stretches of water and caught more fish ending the day with about 25 or so. The fishing was a little off, not sure if it was a cold front that passed through or what….but it was certainly slower than I would have expected. I mean if you know where the fish stack up as colder weather causes them to do…and you know the flies to use and how to rig them, ordinarily we’d probably catch twice as many. But 25 is still a good day and thankful for it. Tony is always a blast to spend the day with..